When having a new roof installed on your home, it is always a good idea to hire a licensed professional roofing contractor for the job. An experienced roofer can bring unmatched skill and labor to the project that others might lack. Here are the most common reasons why you should always hire an experienced professional for the job. What Are the Top 10 Reasons Why to Hire a Professional for a New Roof? Workmanship: An experienced roofing contractor will bring a higher level of quality and workmanship to the job. Simply put, they have seen it all and possess the knowledge to detect and remedy both small and large problems that may be discovered during the project. Having a professional roofer complete your project will ensure you will have a properly installed, waterproof roof that looks great. Materials: Most roofers have access to better quality materials that not only look better, but also last longer. Often times they can obtain these higher quality materials at a discount and pass some or all of that savings along to the homeowner. Warranty: The materials provided and labor completed by a licensed roofer will have written warranties that guarantee the completed project. Most of the time, the installer will give you, the homeowner, a choice of different materials to be used with each one having it’s own individual warranty duration. Their labor is typically also guaranteed for a set number of years against failure or defects. Property Value: Having a new roof installed on a structure which the homeowner plans to sell or rent in the near future will typically increase the demand and property value of the home. Providing legal documentation showing the age of the roof and that it was recently installed by a professional can make your home more appealing. Also having a documented warranty is a big plus to potential buyers or renters and may possibly even deliver a higher sale or rental price. Faster Service: A professional roofing company will have the skill and knowledge to get the job done quickly and efficiently. For most average size homes the project can be completed in one day by a small crew. Clean Up: The majority of roofers will make arrangements, before beginning the project, to clean up and haul away all removed and unused materials from the job on the same day. They will leave the home and property with the same appearance as when they arrived with the exception of the great looking new roof! Professional Results: You want to get the job done right with a perfect appearance the first time. Stemming from experience, professional roofers have the ability to avoid blemishes or any issues with shingle uniformity. They will also have the skill to make sure everything meets local building codes. Discounts: Many times a reputable group will offer discounts for anything from being a senior citizen to allowing the company to place an advertising sign in your yard for a few weeks after the project is complete. There are also many legitimate licensed roofing contractors who offer published coupons or discounts for referrals. Contract: Someone who is reputable will have a contract that is agreed upon and signed by the homeowner before the work starts. Typically this will have limits on the amount of unexpected cost that can be added for any unforeseen problems that may arise. Insurance: Trustworthy professionals will always be happy to provide proof of current insurance for protecting themselves, the workers, you, your home, surrounding homes and their equipment should anything unexpected happen. Most also have workman’s compensation insurance for their crew. Having a new roof installed is no small project. It is always a wise investment to hire a licensed professional for the job. 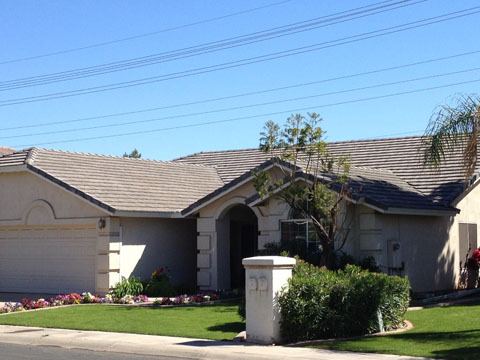 Are you looking for a new roof, or repair work in the Mesa area? Express Roofing LLC can help. Contact us today at (480) 226-4245, and get the best pair of expert roofers on the job.